You’ll have great chances to make connections when most of the students at your college are in your major! The majority of students at the colleges below study Agricultural Production for a reason. Find out what makes all the programs at the colleges below unique. If You're Limiting Your Search to the Far Western US Region, Which Schools are Most Focused on Agricultural Production? If you’re looking for more information about the rankings below look at the Most Focused Ranking methodology page. Every student who is interested in Agricultural Production has to take a look at California Polytechnic State University - San Luis Obispo. California Polytechnic State University - San Luis Obispo is among the largest schools in California. About 66.0% of the teachers at Cal Poly San Luis Obispo have full-time hours, which means they should have plenty of time to work with students in their class. Parents, you'll be glad to learn California Polytechnic State University - San Luis Obispo features a relatively low crime rate. Where is California Polytechnic State University - San Luis Obispo doing the best? Look into all the college rankings. University of Hawaii Maui College is one of the finest schools in the United States for Agricultural Production. The surrounding area of a major city is tremendous for young people seeking ample opportunities for networking, adventure, and life. The student body at this school is very diverse and includes undergraduates from across 9 states and territories and at least 1 countries. If you're concerned with racking up an excessive amount of college debt, you should be aware that graduates leave University of Hawaii Maui College with about $19,752 in student loans. In what areas is University of Hawaii Maui College really succeeding? Check out all of the school's rankings. Washington State University is a good choice for students pursuing an Agricultural Production degree. Students who enjoy a more slow-paced life will appreciate Washington State University's location in the small town of Pullman, Washington. Approximately 40.9% of undergraduates graduate on time at Washington State University, which is much higher than the U.S. average of 37.0%. If on-campus safety is important to you, you'll be glad to know that Washington State University has a low crime rate. Take a deeper dive to check out how well Washington State University ranks in other categories. Every student who is interested in Agricultural Production has to look into California State University - Fresno. With over 20,000 undergraduates, California State University - Fresno is among the biggest schools in the nation. About 52.6% of the educators at California State University - Fresno are full-time and get normal office hours, so they tend to be more accessible to help. Graded #16 in California for overall value, we would have predicted this university's superb educational programs to be more expensive. A virtual tour may be a good way to explore California State University - Fresno. University of California - Davis is a great decision for individuals interested in an Agricultural Production major. Looking for a big school? This institution has more than 20,000 students on campus. Close to 93.0% of first-year students decide to come back to University of California - Davis for their sophomore year of school. UC Davis features a high performing men's basketball team. Obtain all the vital specifics on UC Davis by viewing their scorecard. Yakima Valley College is a wonderful decision for students pursuing an Agricultural Production degree. Yakima, Washington is the perfect surrounding for students who get pleasure from the active urban lifestyle. In addition to this school being one of the finest institutions in Washington, 2.7% of its undergrads are from out-of-state. YVC College has been ranked one of the best for education quality delivered to veterans and active-duty military. Interested in learning more details on Yakima Valley College's campus? Have a virtual tour. 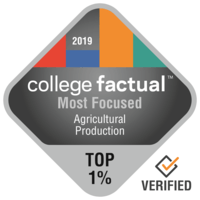 It's difficult to beat Lake Washington Institute of Technology if you want to pursue Agricultural Production as a major. The location of Kirkland, Washington, is satisfactory for students who prefer a less busy, suburban space. Freshman students are not required to live on-campus at Lake Washington Institute of Technology. This school is well-known for the support of military personnel and is the 407 best in the United States for veterans. Go deeper to check out just how well Lake Washington Institute of Technology ranks in other categories. Skagit Valley College is among your best bets if you want to study Agricultural Production. Based in Mount Vernon, Washington, this institution is a strong option for students who enjoy the exhilaration of a large city. This school is known for its success of military students and is ranked 630 best in the United States for veterans. This school does not require first-year students to live on-campus. For more information, see the college scorecard.